Abuzz with bees and butterflies, Laurier’s community gardens are places where people come together to nurture, develop and sustain growing spaces in our communities. The communal pursuit of social sustainability initiatives, such as community gardens, has a long list of benefits, including youth education, better health, food security, cultural preservation, leisure and community empowerment. Laurier is embracing these powerful community-building spaces this summer through garden and apiary initiatives. 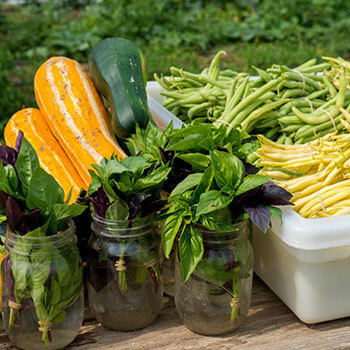 Community members can get their hands dirty at Laurier’s 14,000 square foot urban micro farm at the university’s Waterloo campus (Northdale site, 66 Hickory Street West). Members of the community can rent an urban garden plot, run by Patchwork Community Gardens and KW Urban Harvesters. Through a partnership with Young City Growers, the university is able to offer students, faculty and staff weekly bushels of fresh, home-grown produce during the harvest season through a Laurier Community-Supported Agriculture (CSA) program. At just $16.50 a week for 10 weeks, the CSA program is quite affordable. And a student share is only $8.25 a week. The garden, established in 2013, evolves and adapts to the needs of the Laurier campus and community. Meaning ‘good, bountiful earth’ in Ojibwa, the Mino-Kummik community garden is located behind the Waterloo Indigenous Student Centre. This innovative outdoor ceremonial and teaching space is designed as a vegetable and fruit garden and welcomes the entire Laurier community to experience Indigenous culture. As an Indigenous community garden at Laurier's Brantford campus, this space provides students, staff and the wider community with real-world experience learning about the practical uses and healing properties of native plant species. Garden care and knowledge-sharing sessions are held each Monday morning from 10 a.m. until noon throughout the summer and focus on growing techniques, as well as Indigenous knowledge. Bee season is almost here and this means a lot of activity at Laurier. Through a partnership between Laurier’s Sustainability Office, Facilities and Asset Management, and the Office of Indigenous Initiatives, two honey beehive colonies already call Laurier’s Northdale campus in Waterloo home. The buzz will hit Laurier’s Brantford campus later this year, when two honey bee colonies are installed on the rooftop of the Market Square building. Honey bees have a distinct role to play in our ecosystem — but so do wild bees, and both are dwindling in numbers. The success of Laurier’s community gardens relies on volunteers. For those interested in volunteering time, donating skills and learning something new along the way, email Tyler Plante at tplante@wlu.ca. All levels of experience are welcome.